The University of Maryland has once again made The Princeton Review's list of the country's top entrepreneurship programs. In the 2014 list of the "Top 50 Schools For Entrepreneurship Programs," published in Entrepreneur magazine, UMD ranks No. 15 for its undergraduate program. The university also ranks No. 16 for its graduate program, up eight spots from the 2013 rankings. Entrepreneurship education initiatives offered by the Maryland Technology Enterprise Institute (Mtech), a unit of the A. James Clark School of Engineering, played a key role in the new ratings. Mtech's programs featured 18 entrepreneurship courses with 1,003 enrolls in academic year 2011-2012, along with two living-learning programs, one community college transfer program, seed funding and mentoring. Mtech's overall programs add to these offerings with a business model challenge, product development funding, free intellectual property services, entrepreneur office hours, a venture accelerator, prototype lab, incubator, and additional support for companies throughout their lifecycles. Hinman CEOs Program: As the nation's first living-learning entrepreneurship program, Hinman CEOs is a groundbreaking initiative placing entrepreneurially-minded students from all technical and non-technical academic disciplines in a unique community. Students live together, learn about entrepreneurship, and can launch new ventures. Hillman Entrepreneurs Program: Hillman Entrepreneurs is a scholarship program for students beginning their study at both Prince George's Community College and Montgomery College who have an interest in entrepreneurship and an enthusiasm for starting a business venture or leading a company. The program includes entrepreneurship and leadership courses, intense mentoring, networking opportunities, and community building. University of Maryland Business Model Challenge: This new annual competition promotes the commercialization of innovative ideas and university-created technologies by focusing on identifying and precisely defining the assumptions of the new venture, testing those assumptions in the field, and then changing (pivoting) based on the lessons learned. MOOC: Developing Innovative Ideas for New Companies: one of five Coursera pilot courses for UMD, this entrepreneurship course, taught by Mtech's James V. Green, saw 200,000+ enrollments in 2013. 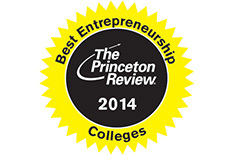 Based on surveys sent to school administrators at more than 2,000 institutions from April to June in 2013, the The Princeton Review's lists recognize 50 programs in all—25 undergraduate and 25 graduate—for their excellence in entrepreneurship education.